Material and Methods: In this study, AP-ROP cases treated with IVB in between 2015-2017 were evaluated retrospectively. These cases were analyzed for birth weeks, birth weights, postgestational weeks at treatment, complete retinal vascularization times, recurrence rates and need for additional treatment. Results: Twenty-one eyes of 11 infants were evaluated. IVB injection was performed in 12 eyes of 6 patients (0.625 mg/0.025 mL) and 9 eyes of 5 patients (0.312 mg/0.012 mL). The mean gestational birth week of these cases was 27.6±2.0 (24-30), the birth weight was 1108±377 (680- 1880) g and the mean post-gestational treatment week was 35.2±2.0 (33-39). Regression of ROP signs and plus disease was observed in all cases after treatment (100%). Additional laser photocoagulation therapy was performed to 4 eyes of 2 infants due to reactivation signs. Full retinal vascularization was achieved in 9 eyes of 5 patients in the follow-up period of these cases. 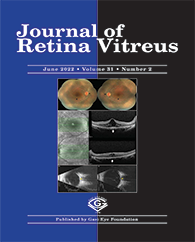 The mean complete retinal vascularization week was 59.4±12.7 (52-82).